If you’re at all like me, you have a lot of old technology lying about. One of the most common forms of that old tech is in the form of old cellphones, which means for me, smartphones. One of the solutions I have employed for upcycling these phones is to use them as streaming media jukeboxes. For newer phones, this solution requires nothing more than a factory reset. 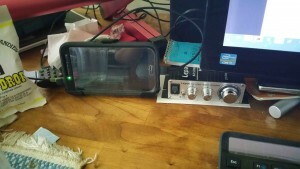 Originally, I had an old Samsung Galaxy Note 2 (affiliate) plugged in by the audio jack to a Lepal LP-2020A+ Digital Audio Amplifier (affiliate) driving a Dayton Audio B652 6-1/2-Inch 2-Way Bookshelf Speaker Pair (affiliate). Since then, I have swapped the Note 2 out for a Droid 2 doing the same work. I reset the phone to its factory settings then installed the various music services I use (Pandora, Google, Amazon). Now, I have a dedicated music device separate from my PC. Do you have other uses for old smartphones? Mention them in the comments.